Authorities in Senegal have detained four British men who were sailing a decommissioned warship mounted with two cannons towards the Gulf of Guinea. The foursome were apparently in Senegal to discuss the possibility of providing their services to the government to scare off illegal fishing boats. But their final destination may have been Nigeria, according to one report. The recent hotbed of piracy has many oil rigs, for which the crew had hoped to provide security. But before they reached Nigeria, they had trouble all along the way. Before armed commandos boarded their ship in Senegal and took them away, the ship had been impounded in the Canary Islands, controlled by Spain. When their ship, named the Defender, encountered technical difficulties off the coast of Spain, they were forced to stop in the port of Tenerife. 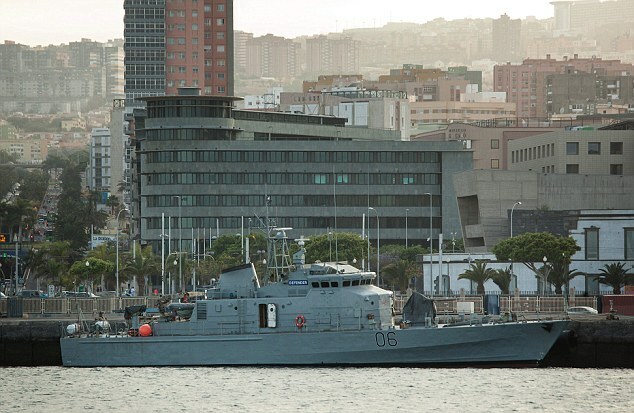 The Spanish were very suspicious of the vessel, which was flying a British flag and looked very menacing. Further suspicions were raised, and the group was officially detained, when authorities found several inconsistencies in the paperwork associated with the ship. The owner of the ship, Chris Enmarch, was fined 40,000 euros for deficient waste-disposal systems and safety-equipment issues. Enmarch is an ex-Royal Navy submariner who purchased the boat in 2011. Insisting that they were not mercenaries, and that there were no working weapons on board was not enough to satisfy the Spaniards. They kept the ship in port for five weeks before the Defender slipped away in the night when guards were otherwise-occupied. Five days later, though, they were arrested in Senegal. Local authorities arrested them on suspicion of illegal activity, and would not provide further details. Enmarch had told newspapers in the past that the goal of the ship was to look fearsome enough to deter attackers from a distance. But if tested, it is unclear if or how the crew intended to defend itself. He has adamantly denied that he and his crew intended to become mercenaries. While Enmarch had hoped to offer his services to private companies defending their cargo from pirates, it looks like the ship was too intimidating to even make it to its destination. The British Consulate made a statement indicating it was aware of the situation and would be providing legal aid to the four detainees.